Sony has introduced a new touch sensor technology, called floating touch with the launch of Sony Xperia Sola smartphone. The technology lets you interact with the phone without touching it through hand gestures. It lets you control the user interface by letting your finger hover above the screen. Floating touch enables the phone to register your finger up to 20mm above the screen. So how is this done? Well, let’s find out. Erik Hellman, research engineer at Sony Mobile and one of the inventors of the technology, explains that there are two types of capacitive sensors used for touch screens, mutual capacitance and self-capacitance. Mutual capacitance makes multi-touch detection possible. 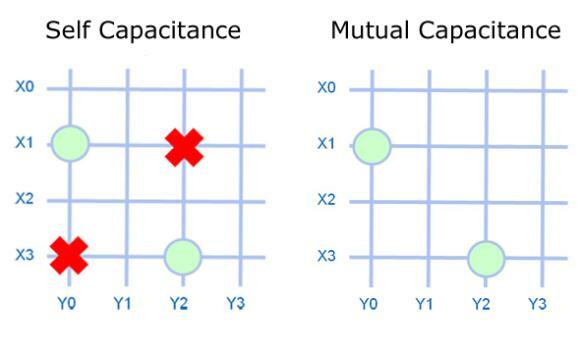 Self-capacitance generates a stronger signal than mutual capacitance, which allows accurate detection of the finger further away from the sensors. However, with self-capacitance it is not possible to perform multi-touch detection due to an effect called ghosting. With mutual capacitance, each intersection of a line in the illustration above forms a parallel plate capacitor. This means that each intersection is a sensor, which allows for true multi-touch since the position of each finger can be exactly measured. However, because the area of the intersection between two lines is very small, the electrical field of the sensor is also small. Since the field of the sensor is so small, the signal from it has a low strength. This makes it poor for sensing very small signals, like when the user’s finger hovers above the screen. Looking at the graphs above, each X or Y line as whole is a capacitive sensor, in the case of self capacitance. This means that the sensors are larger compared to the mutual capacitance described above. The large sensors create strong signals, which make it possible to detect the user’s finger up to 20 mm above the screen. When a finger is on or just above the screen, the nearest sensor lines are activated (X1, Y0). If two fingers are detected, ghosting positions occurs since four lines activated. As you can see in the graph above, this gives four possible touch positions (all four activated intersections of X1, X3, Y0, Y2 in the illustration), and the correct combination is unknown. This makes multi-touch impossible. Floating touch is solved by running both mutual capacitance and self capacitance, on the same touch screen, at the same time. Mutual capacitance is used for the normal touch sensing, including multi-touch. By running elf-capacitance at the same time, we can detect a finger above the surface of the screen. However, since the floating touch technology depends on self capacitance, it is not possible to perform multi-touch gestures with the fingers hovering above the screen. However, multi-touch will work fine for the normal touch gestures on the screen. By leveraging on the existing capacitive touch sensor, and lowering the threshold for touch registration, it will be possible to differentiate between floating touch and “normal” touch. All Android applications will work perfectly fine, just like before and only the apps that explicitly “listen” for floating touch events will react to them. So now web developers can make use of the technology already now through the standard HTML5 hover events that is implemented in the native Android browser of Xperia phones. But Sony has more in the pipeline for developers as the upcoming Ice Cream Sandwich (ICS) upgrade for Xperia Sola, third-party developers will be able to utilise the technology in their own apps using the new open API introduced by Google in ICS to handle hover events.